This game is inspired by the old 'Space Invaders' arcade game. A bunch of goblins are making their way towards you across a narrow valley and your only hope is to shoot them down before they reach you. For 1 to 2 players. One palyer controls the bolt thrower. If there is another player he may roll for the goblins. There isn't really any need for a second player as he can't influence the what the goblins do but it's more fun. A bolt thrower of some sort. Any type is fine. A bunch of goblins with short bows. The number depends on which type of bolt thrower you use. 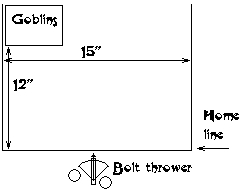 The number of goblins should be so that the total cost of goblins (each goblin costs 3 points with short bow) is about one and a half times the cost of the thrower. A movement tray for the goblins makes moving them a lot easier. Something to mark off the edges of the playing area with - string or masking tape works good. The area should be about 15" wide and 12" deep. The goblins are placed at the far end of the field, so that it's 12" between them and the 'home line'. If the goblins cross the home line they have won. If they are chased off the field they have lost. The bolt thrower starts the game in the middle of the valley, behind the 'home line'. No-one can move off the sides of the field. And so on. Note that sometimes the bolt thrower or the goblins will be unable to shoot because they have moved too far. The goblins are deployed in a formation about 1.5 times as wide as it is deep. If you have a movement tray to move them in things will be a lot easier. The goblins will start the game by moving to their left. To see how far they move roll 2 D6. The goblins will move the highest number rolled in inches, unless the roll is a double. Then they move the total number rolled in inches. So if the dice come up as a 4 and a 5 the goblins move 5 inches. If the dice come up as a 3 and another 3 the goblins move 6 inches. When they have reached the left side of the area they will move the remainder of the dice roll straight forward. So if the goblins are 2.5 inches away form the side of the field and the dice come up as a 4 and a 5 they move 2.5 inches sideways and 2.5 inches forward. Their next move will be to their right and they will continue going right until they hit the right hand side of the field when they will move forward again and so on. Their path will be a sort of snakelike trail. If the goblins move into contact with the home line they have won. If the goblins did not roll a double for their move distance then they may shoot at the bolt thrower. Their short bows have a range of 16" and the goblins may only shoot directly forward. Use the normal shooting rules. Their BS is 3 and the weapons' strength is 3. Randomize any hits between the machine and the crew. Since the machine has a toughness of 7 this means that any randomizing roll that comes up as a 5 or 6 have hit the crew while the rest are discarded. Roll to wound and save using the normal crew of the thrower. The crew may move the bolt thrower sideways to get a shot at the goblins (the thrower may only shoot directly forward), but this will make it harder to shoot. Regardless of type the bolt thrower may move up to 6". If any crew are killed the maximum move is reduced proportionately, so if the crew has a crew of 3, then it may move up to 4" if one crew is killed, and up to 2" if two are killed. If it has a crew of 2 then it may move up to 3" if one member of the crew is killed. The thrower never has to move if it doesn't want to. The thrower may shoot one or more times during it's turn, depending on it's type and the chance of hitting depend on the BS of the crew. If the thrower didn't move it may shoot as normal. If it moved but less than 3" (regardless of it's maximum allowed move) then it will have a -2 modifier for it's to hit roll(s). If it moved 3" or more then it may not shoot at all. Goblins have a toughness of 3 and will get no armour save. Rank piercing is worked out against the rank directly in front of the thrower, but models are removed in the usual manner (i.e. from the sides of the rear rank after you have calculated how many are killed). If the thrower fires multiple shots then the models that are hit will be from different but adjacent ranks. If 25% or more of the goblins are killed in one round of firing then they will have to take a test against their leadership of 6. If they fail it they will flee and the bolt thrower will have won. The goblins win by either moving into contact with the 'home line' or by killing all the crew of the bolt thrower. The bolt thrower crew win by either killing all the goblins or if the goblins fail a panic test for taking 25% casualties from one round of shooting.